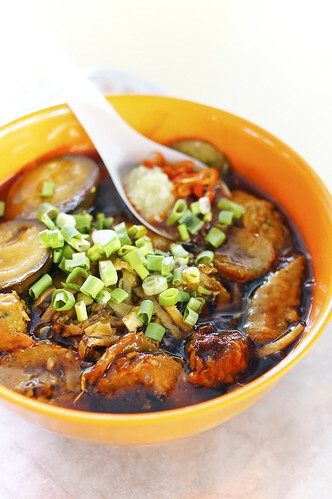 Hainanese Village Food Centre is a very popular makan place in the Hougang area, especially during the weekend. Like any other hawker centre in Singapore (except for the Kopitiam Square in Sengkang), there are lots of good hawker stalls. My mission is to try out these reputable stalls and let’s see why are these stall so popular, or not. Hup Huat hawker stall is one of the few that serves only white carrot cake. The most distinct taste about this carrot cake is for it’s very crispy exterior. 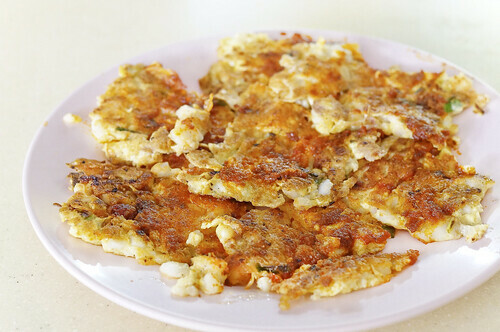 I can see that the hawker actually prepares each plate of carrot cake with care as he skillfully splits the big pan of carrot cake into smaller rectangular portion and to be pan fried to crisp. From my observation, unlike some crispy fried oyster egg that is soaked and fried in oil, the oil that this hawker used is significantly lesser, and it does not taste too greasy as well. I like this stall for their generous serving of eggs that holds the carrot cake together and this may be one of reasons why this carrot cake is so crispy. The unique thing about Hup Huat White Carrot Cake is their chilli is not stir-fried with the carrot cake but is spread onto the top surface of the carrot cake like how butter is spread on a toast. If there is one area that can be better, i think they can consider sprinkling more Chye Poh (preserved radish) into the carrot cake. There is a $2.00 and $3.00 option and mine was the $3.00 portion. Very well know for their great tasting coffee at economical price. Their coffee gives off a very strong coffee aroma that is not usually found in ordinary food court coffee and it’s not because they purposely made the coffee “gao” (thick). Da Zhong prepares their own coffee mixture and sent them for grinding to powder form. Generous serving of salted butter in their toast is one of my reasons to patronize this stall. 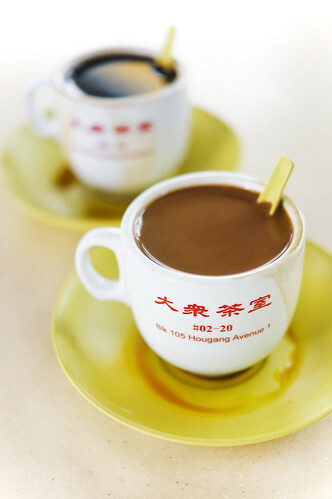 This stall started their business in the 1970s before relocating to Hougang in 1983 with more than 30 years of coffee making experience. Operating hours: 6.30 am to 12pm. Closed on Mon and Thu. The most prominent hawker stall with the longest queue in the morning. Unlike many Nasi Lemak stall, the main attraction for this Nasi Lemak stall is not chicken wing (in fact they don’t even offer chicken wing) but for their well flavoured Kuning fish. 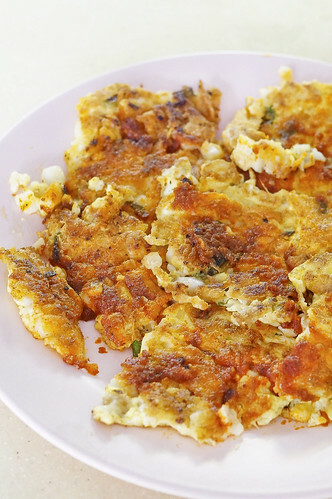 The fish is fresh, well-fried and yet the meat remains moist and tender. 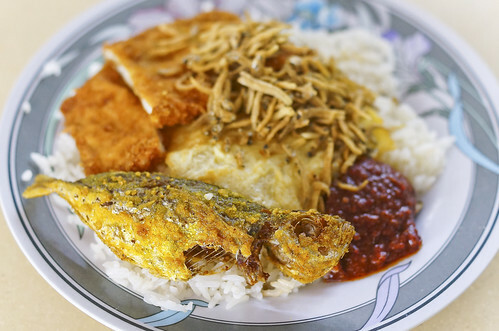 Ikan bilis is the non-sugar-coated version and chilli is less sweet than a typical Nasi Lemak Sambal Chilli. Price for a plate of Nasi Lemak cost me $2.50 for Omelette, Kuning Fish, Ikan Bilis and Chilli Sambal. Not exactly cheap for the kind of ingredient offered but I like their Nasi Lemak for it’s distinct taste of coconut milk fragrance. This is the stall that always has a constant queue at Hainanese Village Food Centre. The best thing i like about this Lor Mee is they replaced the braised pork belly to a healthier shredded braised duck meat. It comes with a $2.50 or $3.00 option and a bowl of $3.00 noodle comes with plenty of condiments like braised egg, dish cakes and two kinds of Gnor Hiong (bean curd skin meat roll) and of course the shredded duck. The gravy is not starchy and very flavorful to an extend of some people may find it a little salty. But it works fine for me. Queuing up for 30 minutes on weekends is a norm to be able to enjoy a bowl of Lorong Ah Soo Noodle. This stall has some mixed reviews online for it’s taste. I personally like it but probably will not queue up for half an hour for this Lor Mee as there are many other good options in Hainanese Village Hawker Centre. If the wait is only 15 minutes, then this works for me. 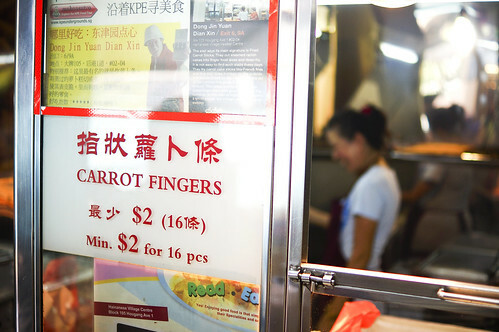 This stall offers fresh piping hot Carrot cake Sticks at $2 for 16 pieces. I ordered this a couple of time and the carrot cake sticks are warm at a minimum while retaining it’s crispness. Best when the carrot cake Sticks are served right from the frying wok! Super crispy exterior and the inside is still soft and chewy. 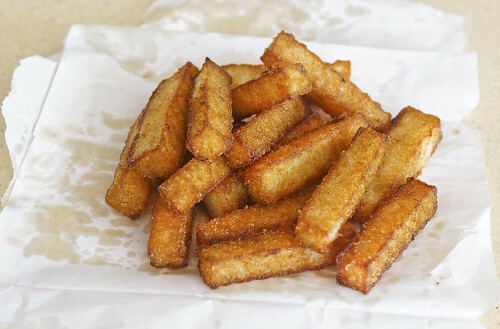 Fried Carrot Cake Sticks is one of many people’s favourite hawker food that is slowly disappearing from Singapore. There is a “Stall for Rent” sign pasted on the front of the stall. Better eat this while you can! I am aware that there are a few good Kway Chap still in Hainanese Village Food Centre. What actually attracted me to patronize this particular Kway Chap is actually the old lady who is preparing the Kway Chap. She looks like she is already in her 70s and yet looks so fighting fit and so resilient. Really hats off to her. Best thing i like about Lai Xing’s Kway Chap? Lai Xing’s Kway is very soft and thin which absorbs the soup easily which makes the Kway really flavorful. I do hope that there was more soup though. Their pig intestine is very well marinated. Though it’s not the best pig intestine around, but this intestine taste very clean. It’s not tough but yet retains it’s springiness. I was also quite surprised by their lean meat. 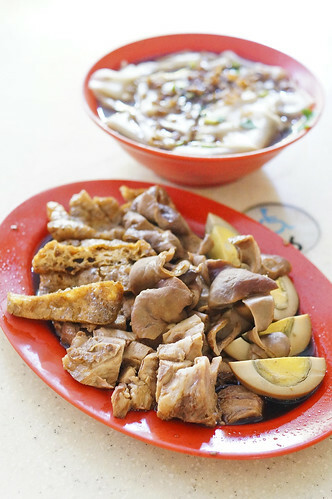 Most lean meat should be rather dry and tough but Lai Xing’s is tender and full of flavor. This is not exactly the conclusion cus i will be going back to try the Cripsy Carrot Cake, the so-call overrated Lorong Ah Soo Lor Mee and apparently there is another Kway Chap that is quite popular in Hainanese Village Food Centre. 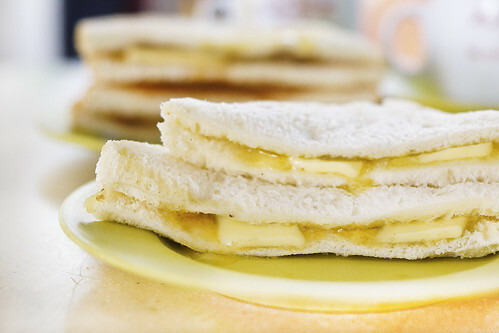 I have always been proud of our Singapore’s hawker food culture so i think it is important to support our hawker food and as well as writing reviews on them to share these information instead of only cafes and restaurants. If i can only have an option to choose between having hawker food or restaurant food for the rest of my life, i guess i am someone who will choose hawker food. Feel free to suggest any stall at Hainanese Village Food Centre that you find it’s worth the eat!